Quarterback Marcus Mariota accepted the first ever Heisman Trophy awarded to an Oregon Ducks football player with a touching and gracious speech. Rather than merely celebrate his victory, Mariota expressed gratitude for his family, his community, and his team. Mariota continued, thanking the University of Oregon for the opportunity to play football and receive an education, the community of Eugene for being supportive, and his friends and neighbors home in Hawaii for shaping his character. “Thank you for sacrificing, and for providing me and Matt every opportunity we could ever have. Words can’t express how much you guys mean to me. I am truly grateful to have you guys in my life. Mom and dad, thank you for your love and for sharing it with me and Matt. We are truly grateful,” he said. Many of Mariota’s teammates stated that he was as good of a person off the field as he was a player on the field. 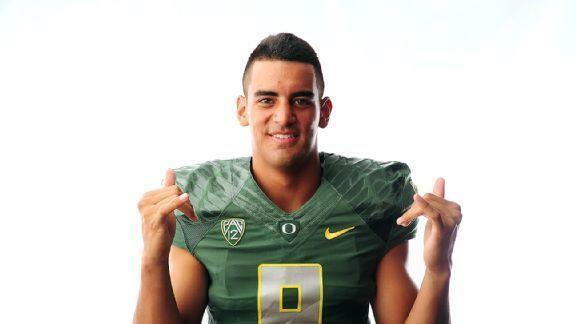 Mariota won the award with 90.9 percent of total points cast—the second highest margin in Heisman history. Hana is currently pursuing an undergraduate English degree with a Spanish minor at Concordia University Portland. She loves creative writing and reading children's books and someday hopes to publish her own. Favorite hobbies include cooking, cleaning, eating ice cream, and singing Disney princess songs.